Shock the competition with Mega blasting in a micro size! The Nerf N-Strike HotShock blaster is a compact blaster that fires Mega Whistler darts. 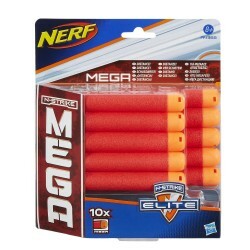 Load a Mega dart into the barrel, pull the handle back, and pull the trigger to send the dart screaming through the air. The blaster has storage for 2 darts for fast reloading during the heat of battle. Comes with 2 Mega Whistler Darts. 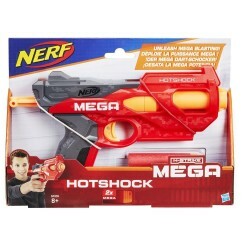 Keep the action hot with the Nerf N-Strike HotShock blaster! Includes blaster and 2 Mega Whistler Darts.